Please keep your “sick and tired” friends and their children in mind as you read this. On a recent trip to Denver I ran into several scenarios that you or a friend might relate to. I am trying to open your eyes as to how pervasive gluten intolerance is. We drove a lot and if I had occasion to talk to someone along the way about my book and the hazards of gluten, I did. Now I didn’t talk to that many people and I was shocked at the numbers already doing the GF diet and those who had no idea that gluten could be linked to their ailments/symptoms. I spotted a rib-thin child with circles under his eyes and a narrow chin (these can be typical signs of classic celiac disease); he was traveling with his parents and two siblings. We were on the concourse train at the airport so time was limited. I immediately introduced myself, and the subject matter of Toxic Staple to the mom and said, “I’m pleading with you to read the information in my book,” as the train drew near the last stop and I handed her my card. She didn’t say the child had been tested and we didn’t have time to get into any other issues he might have been experiencing (fatigue, achy muscles and bones, irritability, hungry all the time, belly ache, intestinal issues, etc.). This parent will need to be armed with testing info I spell out in the book, since the child’s doctor obviously hadn’t offered testing, or if s/he did, it wasn’t enough. I realized later I had one book with me and I was kicking myself that I hadn’t given it to her. This same mom, as we were heading to the escalator, told me of a family of 4 children who were all having issues. Two were hallucinating and on psychotropic drugs; I didn’t have time to find out about the other children. Yes, psychoses and many other neurological/cerebral issues are linked to gluten. The children are off gluten and off the drugs and doing fine. I am hoping to hear back about them. (Never stop taking prescribed meds without consulting your doctors. Please see disclaimer above at http://www.toxicstaple.com). My neurological chapter is the longest in the book and links many neuro problems to gluten with great research from around the world. The All American Diet is doing terrible things to our kids and their families. I met another mom whose daughter had mouth sores and was very anxious. She was pale and unwell from about the age of 8 (a teen now I think) and was diagnosed with Behcet’s disease. 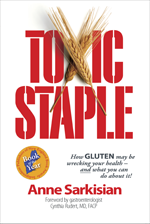 There is little research linking Behcet’s to gluten however it is listed on page 146 in Toxic Staple as one of many manifestations of celiac disease (Abenavoli et al, 2006). I am praying she follows through with the cutting-edge testing in my book; it is a terrible disease. This kid’s life might drastically change for the better if celiac disease or gluten intolerance was uncovered and a strict GF lifestyle was followed. Behcet’s is one of about 20 eight-syllable skin diseases you never heard of that are linked to gluten—along with eczema and psoriasis. One woman whose husband was a chiropractor said her family was gluten, dairy, and bean-free because of the negative affects of these proteins on many people. If she gets a little gluten a rash develops on her hands. Another woman at the airport was in a wheelchair (late 60’s early 70’s). The doctors told her she would never walk again after falling and smashing leg bones, and maybe the hip. She gets around fine, but needs help when traveling. She is on a GF diet. Osteoporosis can be a sign of celiac disease. The problem is you don’t know it until you break your hip or some other bone. Another woman on GF/DF/yeast-free diet needed 14 hrs. sleep and a nap and didn’t wake up feeling rested and about 6 hrs. after dinner the heat would come on like she was on fire. She gets an itchy rash under her breasts if hit with gluten. Another woman told me she had swollen ankles like she might have had congestive heart failure, she couldn’t lose weight, and had hypothyroid. She was doing great on a GF lifestyle except for the dystonia, muscular spasms affecting speech. She didn’t think dystonia was linked to gluten, but I expect it is. Numerous neuro/muscular issues are linked to gluten and much more research is needed. You will find some “brain talk” communities and enough neuromuscular research to make you wonder. On one flight I heard two women talking. One was into infertility research. Wished I’d been sitting beside her because there is huge research linking celiac disease to infertility, sterility, miscarriages, lousy PMS, and numerous other women’s and pregnancy issues. But is anyone educating our doctors? The young mother next to her was talking about ADD and one youngster in the hospital. The neuro chapter has stories on ADD/ADHD, autism (an incredible story) and Asperger’s. Our poor kids don’t have much of a chance with the tainted, overly processed, high gluten/dairy diet they are being feed along with the plastics and chemicals that permeate our food. One retired nurse told me her whole office follows a GF lifestyle and everyone feels better. Her husband chimed in and said his sister’s life has been totally transformed by going GF. Another woman told me her very good friend is having a terrible time even though she follows a GF/DF and I think a couple other proteins are out too. It is important to detect gluten issues early and address them with an absolute diet. Some people who have a difficult time responding to the GF diet probably have a gut that is very out of whack with a destroyed gut biome. They may have other issues they need to clear up before the gut will heal. One woman said she and her family ate little gluten. “Why,” I asked? “Everyone feels better,” she answered. She mentioned that she was having a problem with mold. She was still getting some gluten in her diet. Since she has been doing low gluten the blood tests won’t work so I suggested she get tested with the specialized stool test (Chapter 17). These stool tests are very sensitive and saved my family, as we were all negative on the blood tests. If positive she needs a 100% GF diet. I expect her mold problem will clear up. Mine did, along with a bunch of other allergies. Are You Gluten Sensitive? How Would You Know? Are you misdiagnosed, undiagnosed, or overdosed? Do you have one or more chronic symptoms/conditions that just won’t let up? Do you pick up every cold and flu bug or have a poor immune system? Are you plagued with allergies or asthma? Are your children bouncing off the walls in school, sick a lot, suffering on the autism spectrum, not able to focus, exhibiting behavioral/anxiety issues, etc.? Do autoimmune diseases, anemia, and/or cancer seem to run in your family? Are you suffering with liver, cardio, thyroid conditions, and more? Are you plagued with migraines/headaches, insomnia, restless legs syndrome? Do you think illness, arthritis, and lack of energy are just a part of growing older? Are you fed up with too many doctors’ appointments, time lost from work and play, too many meds, and not enough answers as to what’s making you so sick and tired? Wouldn’t you like to feel better, have more energy, and age more gracefully without chronic illness and degenerative conditions? TOXIC STAPLE can help you detect celiac disease or gluten intolerance with significant testing information, and it can help transform your health and life by following a gluten-free lifestyle, if you or someone you love is gluten sensitive.